Nothing could be grander or more beautiful than this spectacular display of premium fresh-cut flowers. 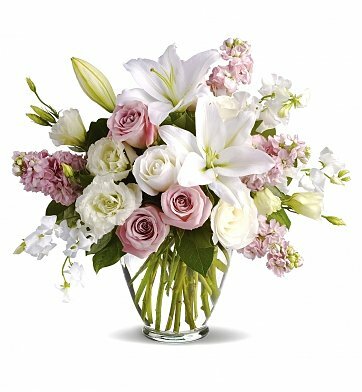 Artfully arranged, the bouquet features white and pink 40 cm roses accented by fragrant lilies, lisianthus, and sweet pea. With its soft hues and romantic design, the arrangement is one of our most desired selections and a wonderful choice for making a memorable statement of your affection. Light Pink Roses (40 cm). Grand Beauty Bouquet is a hand delivered gift. These gifts are delivered by one of our local design centers located throughout the United States and Canada. Same day delivery is available for most gifts when ordered before the cutoff time. The cutoff time for Grand Beauty Bouquet is 2 PM in the recipient's time zone. Delivered on time, and the presentation was just like the picture, very beautiful, and sweet.